All transactions are safe and secure with a reliable history in online purchasing behind each of our associates. 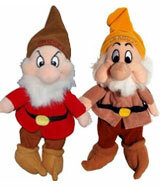 Buy the Snow White and the Seven Dwarfs Plush Toys to own Snow White clothing and merchandise. Do you dream of lightening Grumpy's mood with a big hug? Now you can with this selection of Snow White plush figures. Help Dopey find diamonds or give Sneezy a tissue. Collect your favorite plush Snow White characters like the seven dwarfs and the Prince. Just be careful that a beautiful red apple doesn't spoil your fun. In addition to the Snow White and the Seven Dwarfs Plush Toys above, browse the Snow White Clothing Gallery for more apparel like men's and women's clothes, kids shirts or hoodies.